There’s a small, colorful town in Mexico called Sayulita that’s known for its beautiful beaches and great surfing. I was eager to explore the bordering towns while staying in Nuevo Vallarta, Mexico for a wedding and planned a short day trip there. 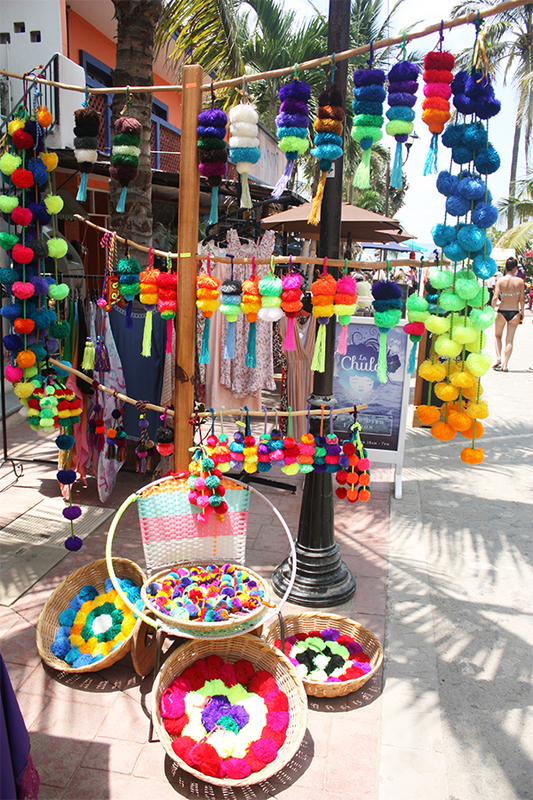 Sayulita is a walkable town saturated with color, crafts, good food (I had the best coconut paleta/popsicle in my life there!) and expats. Everywhere I looked were brightly colored storefronts and modern takes on traditional handicrafts, like amazing dream catchers and long pom-pom garlands in neon hues. Step 1: Make pom-poms using the 3 ⅜, 2 ½, and 1 ⅝ pom-pom makers. To make the pom-poms, wrap yarn around both sides of the tool. For full, fluffy pom-poms, wrap until the yarn fits snugly in the circular caps. Cut around the wrapped yarn following the groove in the tool. Tie thread tightly around the cut yarn pieces. Flip the plastic pieces of the tool up and separate the two sides to remove the pom-pom. Step 2: Trim your pom-poms down cutting any loose or long yarn pieces. This haircut helps make the pom-poms more full and spherical. Step 3: Make your tassel. Wrap yarn around the cardboard piece about 40 times. Lace a single piece of yarn under the wrapped yarn and tie a knot at the top center. Cut the bottom of the threads and remove cardboard. Pull the threads taut and tie a knot about an inch from the top of the tassel and leave the knot tail threads long. Wrap around the knot, tail threads should be below the wraps, and tie another knot with the tail thread. Using the yarn needle, tuck the threads under the wraps up through the top of the tassel, and trim excess thread. Step 5: Thread your braid onto the yarn needle and sew through the bottom of the tassel. Working from small to large, sew through your pom-poms. Tie knots in the braid where the pom-pom centers will be placed, and gently pull pom-poms in place over the knotted braid. Step 6: Once all three pom-poms are in place, create a top loop by folding over a 10-inch length of the braid and tying a knot nestled into the largest pom-pom. Tuck the remaining length of thread into the pom-pom using the yarn needle and cut any excess. Make a bunch in different colors to brighten every door in your home.